The IR510P thermal imaging monocular is a revised model of the original IR510 and now stores images internally, features WiFi connectivity and has a ‘hotbox’ function. The WiFi connection allows stored images to be retreived from the unit using any smart phone or WiFi enabled device and the new ‘hotbox’ function highlights the hottest object in the scene with a box around it. Like its predecessor the IR510P is a compact and lightweight thermal imaging monocular with a 384x288 sensors at its core. This rugged unit has been drop tested to one metre and has an IP67 rating so it can be immersed in a metre of water for up to 30 minutes without sustaining any damage. The rubber armoured body shell with a textured underside allows for a secure grip whether it’s used in the wet or dry. With only four buttons (each allocated only one function – power, brightness, mode & zoom), the IR510 is simple to use day or night. A tap of the power button puts the unit in to standby mode and pressing any button ‘wakes’ the device virtually instantaneously. There are five operating modes – Black Hot, White Hot, Red Hot 1, Red Hot 2 and Red Hot 3. The device is focused using the dioptre dial that is easily adjustable even with a gloved hand. The screen is a 320x240 LCOS (Liquid Crystal on Silicon) display which offers better contrast and a faster response time. The 384x288 microbolometer in combination with the 19mm lens of the IR510P achieves man-size detection up to 400m. The unit has a switchable 2x and 4x digital zoom facility. A built-in rechargeable battery allows for up to 8 hours run time and an External Battery Pack is available as an optional accessory to increase this further. The underside of the unit has a ¼” tripod mount and a retained rubber cap that covers a micro-USB port (used for charging the battery and updating firmware), a charging LED and a Video Out port. 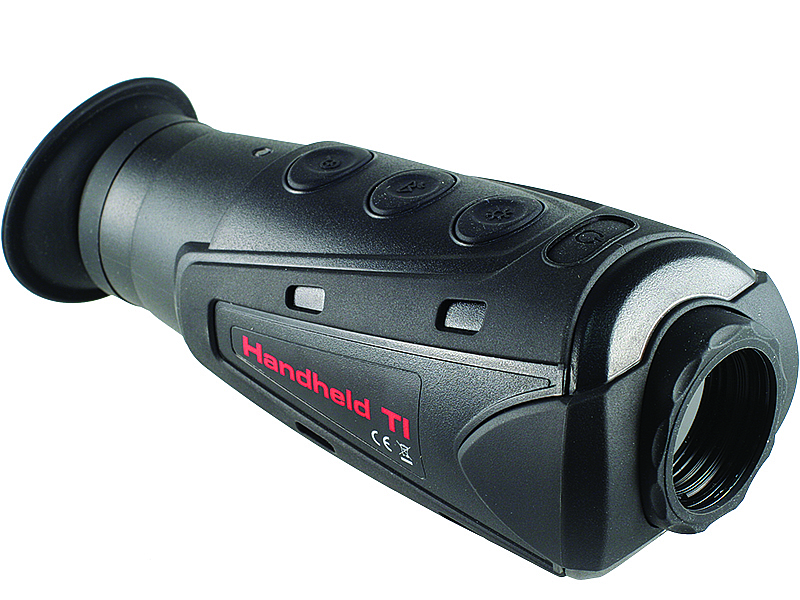 The IR510 also features a built-in short-range white LED torch which can be operated by pressing and holding the brightness button when the thermal imager is off.